These are easy enough to whip up in about an hour. My only complaint (and this possibly is down to my baking) is that they are a little bit dry rather than the moistness you would normally associate with a muffin. The recipe will make 12 muffins. 1) Preheat the oven to 180C/Gas mark 4. Line a 12-hole muffin tin with paper muffin cases. 2) Sift the flour, baking powder and cocoa powder into a large bowl, then stir in the sugar. In a separate bowl, beat the eggs, vanilla, oil and milk together using a whisk. 3) When combined, stir in the chocolate and hazelnut spread. Fold the wet ingredients into the dry ingredients using a rubber spatula or metal spoon until no pockets of flour remain. (Try not to beat the mixture too much or the muffins will be tough.) Stir through the pear cubes and chocolate chips. 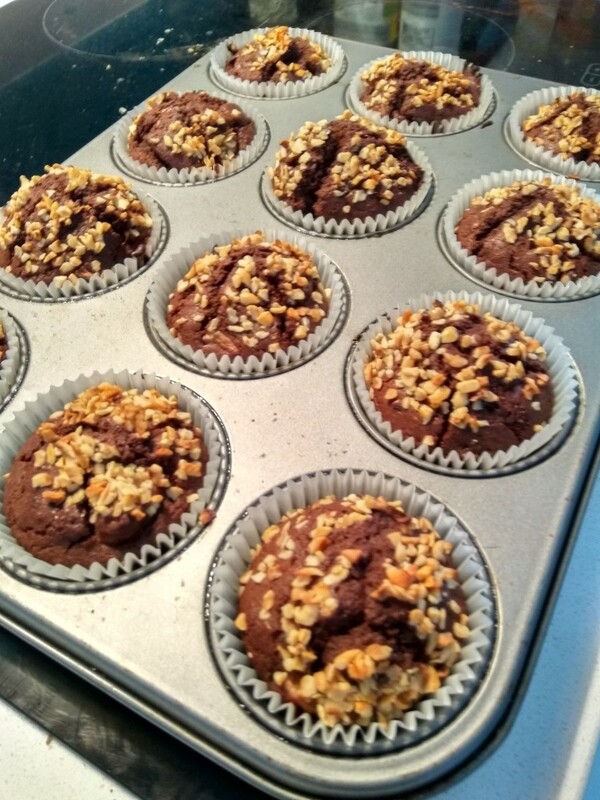 4) Divide the mixture between the muffin cases, then sprinkle the roasted hazelnuts over the top. 5) Bake in the oven for 20 minutes, or until a skewer inserted into the centre of each muffin comes out clean. Allow the muffins to cool slightly before eating.